The Komine JJ-002 Airstream Mesh Motorcycle Jacket is proudly made in Japan at Komine's Tokyo headquarters. The jacket has quality mesh fabric in the main areas, for great breathability as well as 3D mesh pad to improve airflow between the body and the protectors and remove sweat. Boasting level 2 CE protectors on the shoulders and elbows, it also comes with chest guards and honeycomb back protector. While equipping the body with hard protectors, it still allows you great comfort and movement with excellent design and materials. Komine Airstream Mesh Motorcycle Jacket is made for the summer rider that cares about the best quality. Ride in comfort this summer with the JJ-002 amazing airflow. The Komine JJ-003 Mesh Touring Motorcycle Jacket is the 3rd jacket proudly made in Japan at Komine's Tokyo headquarters. 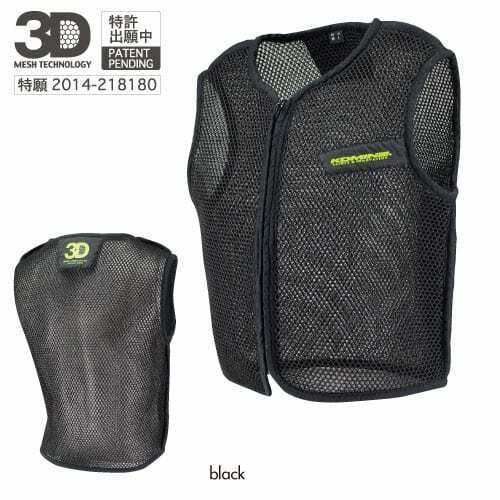 The jacket has quality mesh fabric in the main areas, for great breathability as well as 3D mesh pad to improve airflow between the body and the protectors and remove sweat. It is great for those long rides with an emphasis on durability and protection. The sleeve adjuster works great to suppress flapping at high speeds. 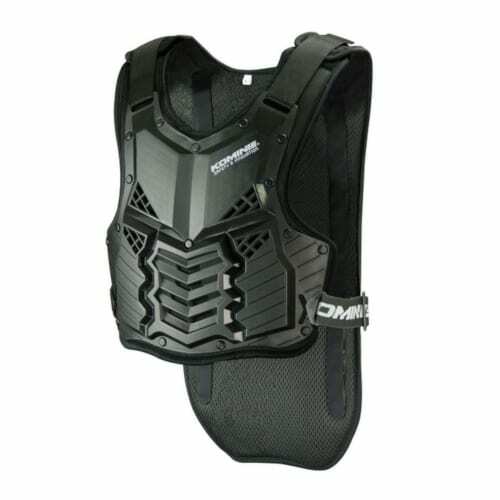 For men's boasting level 1 CE protectors on the shoulders and elbows (level 2 for women's) , it also comes with chest guards and honeycomb back protector. While equipping the body with hard protectors, it still allows you great comfort and movement with excellent design and materials. 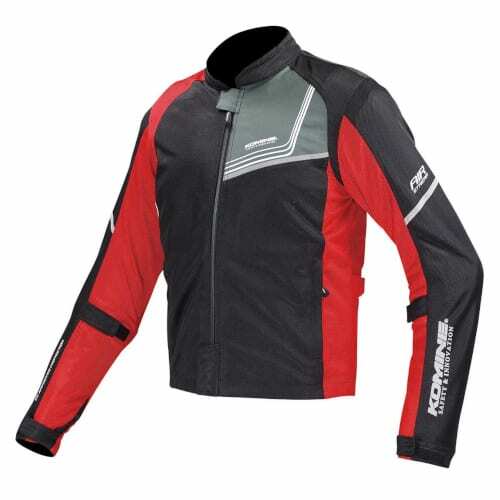 Komine Mesh Touring Motorcycle Jacket is made for the tour rider that cares about the best quality. Ride in comfort on those longer tours with Komine's JJ-003. One of the best quality jackets going round. 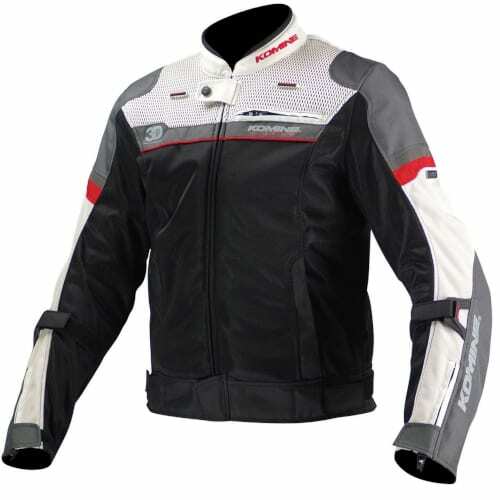 Komine JK-093 Air Stream Mesh Motorcycle Jacket Cordoba is a well-balanced mesh jacket that is comfortable but comes equipped with CE shoulder/elbow protectors as well as included chest and back armor, to keep you safe on the bike and give you peace of mind. The jacket is well rounded and be improved by adding any of Komine's additional liners to it to give you longer season riding. It's a nice looking jacket that comes with reflective paneling and is available in for both men and women. 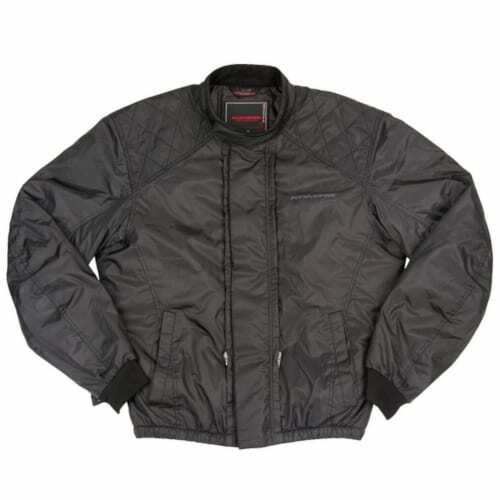 The JK-093 Air Stream Mesh Jacket has great airflow and comfort. 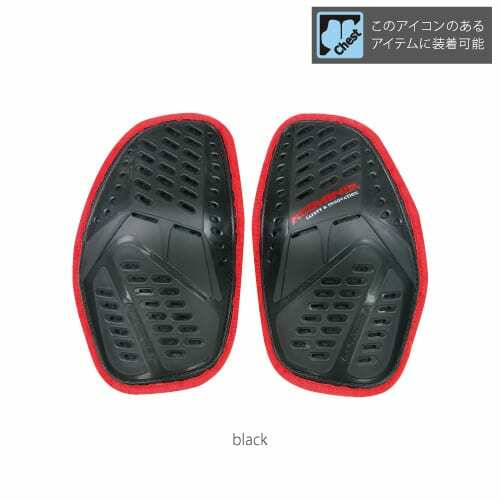 The Komine JK-116 Protect Half Mesh Motorcycle Jacket Hoodoo boasts level 2 elbow and shoulder armor, along with included back and chest armor for a great price. The mesh and textile design offers the flexibility of comfort around the torso and strength around the arms and shoulders. The Komine JK-116 offers great protection and breathability as well as being available in both men and women's sizing. Komine JK-117 Protect Full Mesh Jacket Gimon boasts level 2 elbow and shoulder armor, along with included back and chest armor for a great price. The mesh and textile design offers the flexibility of comfort around the torso and strength around the arms and shoulders. The Komine JK-116 offers great protection and breathability as well as being available in both men and women's sizing. The Komine JK-555 Waterproof Protection 3L Parka is a great waterproof, casual riding jacket that has the safety protection you need when on the bike. With CE amour to the shoulders and elbow as well as a chest and back protector, this jacket has got you covered for impact protection. 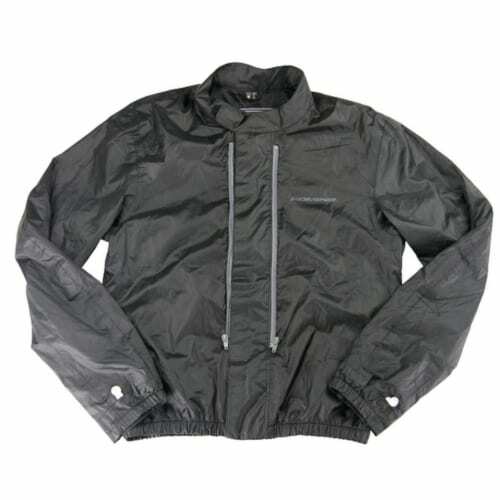 Its 3 layers with a waterproof membrane will keep you dry and reflective qualities will help you be seen. Featuring vents for airflow, women's sizing and a removable hoodie this parka is a great casual style jacket for on and off the bike. .Komine's JK-590 Protect Soft Shell Winter Parka is a casual style motorcycle jacket that has a removable inner hoodie to give you flexibility in looks and warmth. With CE Level 1 and 2 elbows and shoulders as well as included back and chest protectors, the windproof parka will help keep you safe. Offering women's and men's sizing, zippered vents, 3D mesh lining as well as excellent reflective qualities a night, these jackets are are a great all-around option. For the flexible casual look with the safety features, the Komine JK-590 is a great option. 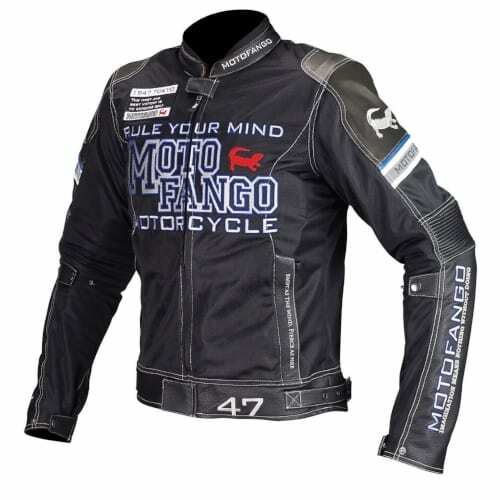 Komine's Motofango MJ-001 Riding Leather Mesh Jacket is a high quality, well made sports jacket designed with quality embroidery that really pops. The mesh style make up has durable goat leather around the shoulders and elbows where it's needed and removable CE protectors throughout. Featuring great flexibility, reflective qualities, 3D mesh lining, women's sizing and great styling. The Motofango is a style of its own. Designed for urban riders that want a casual look Komine's Komine MJ-004 Half Mesh Parka, from its Motofango range, offers great protection features that can be removed if desired. With CE approved protectors in the shoulders and elbows as well as hard protectors in the back and chest, you'll have the impact protection you need for the warmer months. Complete with detachable hood, reflective capabilities, quality embroidery, women's sizes and a style that really stands out. Casual style riding with Komine's Motofango. Komine JK-101 Riding Mesh Jacket Light is available in women's cut only. (please see image of pink jacket) It is available in ivory colour for small and medium sizes and neon for large. It's a great affordable jacket with CE approved protectors in the elbows and shoulders as well as back and chest protection. 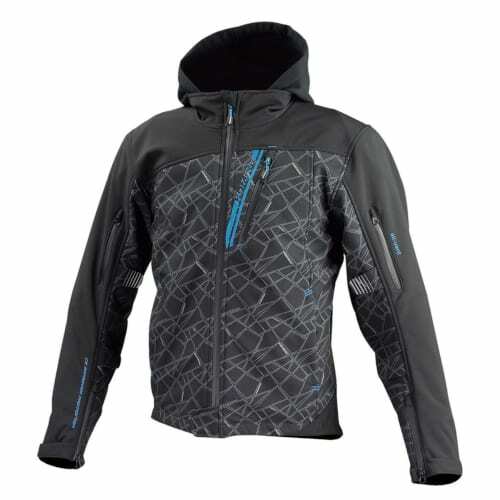 It's a textile and mesh combination jacket that offers reflective features, great air flow and great protection. 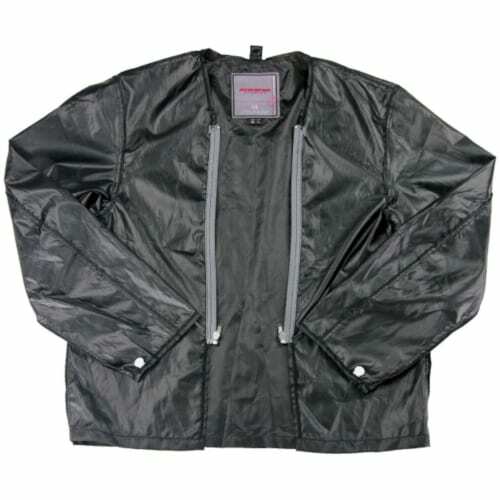 Komine JK-024 waterproof jacket liner comes with attachable zips and buttons for easy integration with your Komine motorcycle Jacket. The windproof, waterproof, breathable liner allows you to turn your riding gear into a 4 seasons option. The inner is 3D mesh lined to create an air pocket between you and the outer shell for great breathability. It also comes with a storage bag included. For use with any jacket with the optional liner logo. Turn your jacket into a winter jacket with Komine's JK-510 thermal insulated jacket liner The polyester and cotton inner comes with attachable zips and buttons for easy integration with your Komine motorcycle Jacket. With 3D mesh lined interior for comfort, this liner can be used on its own. It also comes with a storage bag included. For use with any jacket with the optional liner logo. Can be used with Komine's JK-024 waterproof liner. 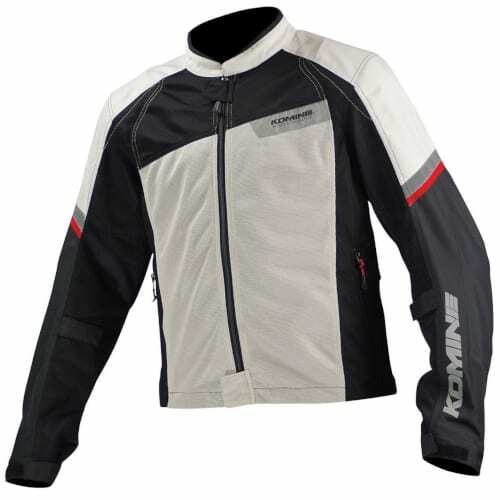 Block the windchill on the bike with Komine's JK-051 windproof jacket liner. The inner attaches itself to your existing jacket with built-in zips and buttons. Made from polyester the smart outer stitching means that you stay comfortable. Storage bag included for when you want to ride liner free. For use with any jacket with the optional liner logo. 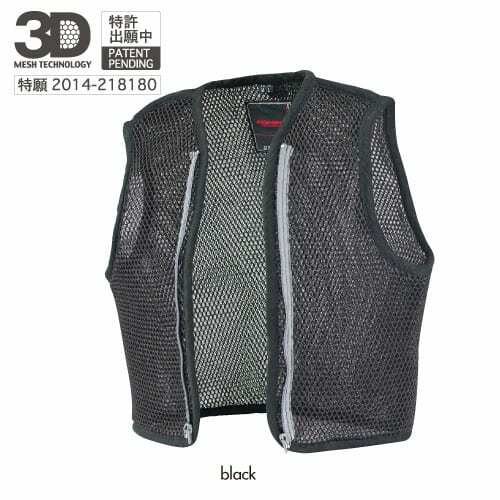 Stay cool on the bike this summer with Komine's JK-078 3D mesh lining vest. The vest attaches itself to your existing jacket with built-in zips for full integration. Made from polyester, the patent-pending, 3-dimensional air mesh vest creates a wind trail between the jacket and the body of the rider, and greatly improves the comfort of the summer. For use with any jacket with the optional liner logo. Stay cool on the bike this summer with Komine's JK-078 3D mesh lining vest. The vest attaches itself to your existing jacket with built-in zips for full integration. Made from polyester, the patent-pending, 3-dimensional air mesh vest creates a wind trail between the jacket and the body of the rider, and greatly improves the comfort of the summer. For use with any jacket. 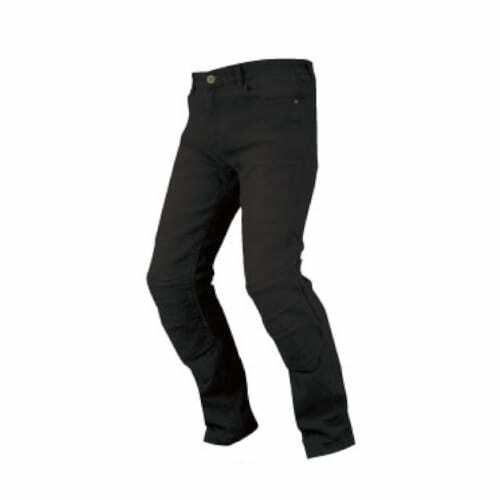 If you're looking for a pair of stylish winter Kevlar jeans then Komine's PK-726 Full Year Waterproof Kevlar Denim Jeans, in black will meet your needs. Coming as standard is a waterproof, breathable liner to keep you dry when the rains kick in. The knees and hips are reinforced with Kevlar and have outer zippers on the knees that house the CE certified adjustable knee protectors. These jeans are built for safety, style, flexibility and comfort with their regular, stretch denim make up. These are the perfect all weather, all year motorbike jeans that you can wear comfortably on and off the bike. Available in women's sizing. Komine WJ-741S Super fit Protected Leather Mesh Ladies Jeans are stretch denim × mesh, high-performance riding jeans which used part of leather as protection against heat to engine and exhaustion. Also, use a leather pocket for durability and luxury. CE standard Level 2 certified protector is equipped as standard on the knees and waist side which are also removable. These are really comfy and stylish jeans for on and off the bike. Komine's WJ-739S Super Fit Protect Mesh Jeans Ladies mesh and stretch denim combination jeans with excellent breathability. The knee and the waist are equipped with telescopic shirring making for good riding posture. The level 2 CE knee protector is easy to put in and out and can be position adjusted in 3 stages. These are a great jean for on or off the bike. Komine's SK-688 Supreme System Body Protector is designed to hug the spine and chest closely for greater protection and has the ability to move with your body. CE approved the protector has 3d mesh padding on the inner layer for comfort and buckles on the side that can be adjusted. With both ladies and men's sizing, this supreme protector is great for any rider. The Komine GK 191 CE High Protect Mesh Gloves are for the rider that loves the benefits of the mesh fabric but doesn't want to give away safety. Fully equipped with CE rated carbon knuckle protector, as well as carbon on the fingers, wrist and palm, make these gloves the great balance between safety and comfortable summer riding. With major impact points supported with leather, the mesh on the palm compliments the armour to give elasticity and comfort for the rider as well as great airflow and sensitivity to the controls. The reflective features help you to be seen on the roads and the touchscreen capability means you won't have to take your gloves off. Quality mesh gloves crossed with safety, comfort and durability at an affordable price. Komine's GK-194 Protect 3D Mesh Gloves offer safety, cooling and affordability in one glove. The protectors are located on the knuckle, back of the fingers and palm slider to give you security on the road. They also offer great aeration with its 3D mesh makeup so you can stay cool, safe and stylish on the bike without spending a fortune. The GK-194 motorbike gloves also feature touch screen capabilities and reflective logo. If your looking for an affordable, yet comfortable, the option with safety protection on the back on the hand as well a carbon slider on the palm then you have found them. Komine's GK-163 3D Protect Mesh Gloves are a nice looking glove that won't cost a fortune. The 3D mesh incorporated into the design, on both the front and back of the hand to create refreshing airflow. Offering touch screen capabilities and a reflective logo to help be seen on the bike. These are an awesome summer riding glove with low profile rubber inner knuckle protector, perfect for daily use. If you're a big fan of the vintage rider look then the Komine GK-161 Vintage Short Leather Gloves will give you just that. The supple, but durable, goat leather construction give you great sensitivity on the controls and the perforation holes make these a great summer glove. Komine has added lycra to the knuckle panel to give a great range of movement in the hand and the outer sewing design keeps the seams from digging into your fingers. The GK-161 are a thin, quality, stylish summer leather glove with a vintage touch..
Komine's MG-001 Carbon Mesh Motorcycle Glove from their Motofango range, are a great looking urban glove. The leather and mesh combination offers both durability, safety and comfort on those hot days. With floating carbon protection on the knuckles, carbon slider and finger protection you can be confident in your gloves while on the bike. they offer great dexterity, reflective capabilities as well as comfort, all bundled together in a nice looking glove. With superior titanium knuckle protection as well as carbon sliders on the wrist, palm and fingers make the Komine GK 212 Titanium Racing Gloves one impressive impact-resistant piece of equipment. Whether you're on the street or the track, the goat leather/cow leather construction has gun-cut stitching for improved comfort and dexterity when out on the bike. They feature leather touch screen capabilities, perforated leather panel, foam padding as well as reflective qualities. This glove is an top quality, excellent looking, impressive glove with outstanding impact features for the serious rider. With superior titanium knuckle protection as well as carbon sliders on the palm and fingers make the Komine GK 213 Short Titanium Motorcycle Racing Gloves one impressive impact-resistant piece of equipment. Whether you're on the street or the track, the goat leather/cow leather construction has gun-cut stitching for improved comfort and dexterity when out on the bike. They feature leather touch screen capabilities, perforated leather panel, foam padding as well as reflective qualities. This glove is a quality, excellent looking, serious glove with outstanding impact features. The Komine GK 193 Protect Leather Mesh Gloves is a well-made summer glove that offers great airflow with the benefit of solid protection. The mesh qualities and 3 vented ducts build into the carbon knuckle protector create great an opening to let the wind flow through the hand as well as the added safety of carbon on the fingers and palm sliders. The combination of these materials added with genuine leather, and touch screen technology makes for a well-rounded summer glove. Ventilation and protection in one nice looking glove. If you are looking for an optimum quality glove for summer riding then the Komine GK-200 Super Fit Titanium Leather Race Specification Gloves will tick all the boxes. The premium titanium knuckle protector and carbon slider, as well as goat leather, make up will offer the protection that you need but the vents on the fingers and behind the knuckles will give you the airflow you need to keep cool whilst riding in the heat. The stretchable fabric on the palm and fingers work really well to create a snug fit without losing any movement or dexterity. These are for the operator who's looking for the premium gloves for summer riding. With European Certification standard on the Komine GK-217 CE Protected Leather Gloves, you can rest assured that you have the highest standard of protection. The floating armour is designed to stay comfortable across the top of the hand so when you grip, the glove adjusts accordingly. Made from goat leather, synthetic and nylon, as well as perforated panels for air flow, these elements all, combine nicely to create a stylish and practical retro looking glove. The touch screen feature round out the all round, well-made glove. The Komine GK 190 CE High Protect Mesh Gloves are for the rider that loves the benefits of the mesh fabric but doesn't want to give away safety. Fully equipped with CE rated carbon knuckle protector, as well as carbon on the fingers, wrist and palm, make these gloves the great balance between safety and comfortable summer riding. With major impact points supported with leather, the stretchy mesh compliments the armour to give elasticity and comfort for the rider as well as great airflow and sensitivity to the controls. The reflective features help you to be seen on the roads and the touchscreen capability means you won't have to take your gloves off. Quality mesh gloves crossed with safety, comfort and durability. With European Certification standard on the Komine GK-179 CE Protect Leather Gloves, you can rest assured that you have the highest standard of protection. The floating armour is designed to stay comfortable across the top of the hand so when you grip, the glove adjusts accordingly. Made from goat leather and synthetic , as well as perforated panels for air flow, these elements all, combine nicely to create a stylish and practical retro looking glove. The finger guard and touch screen feature, round out the all round, well-made glove. The highest level of CE protection on the market (level 2) is what you'll get with Komine's GK-812 CE Waterproof Tourer Winter Gloves HAYUMA. Not only that, they also have waterproof, windproof, breathable liner integrated to keep your hands dry whilst on those winter rides. The unique dual cuff system has an inner cuff and outer cuff so you can place your jacket into the cavity to prevent water running into the glove and stop wind from flowing up your sleeve. Insulated for warmth as well as high-end protection on the knuckles, carbon slider on the palm and finger protection, not to mention reflective and touch screen qualities. The GK-812 winter touring gloves are one of a kind glove. The Komine GK-766 GTX Winter Glove is a premium quality glove that is built with the one and only 45,000mm windproof, waterproof, breathable Goretex liner. The glove is designed to get you through the roughest of winters whilst not compromising at all on safety. Composed with inner armour on the knuckles, fingers, carbon slider on the palm and goat leather on the palm, this glove has great impact qualities as well as the ability to keep you warm in the cold, thanks to a layer of insulation. This winter glove is the combination of supreme breathable water-proof function and excellent fitting and is a must for all those 4 seasons riders out there.